The Harpy eagle (Harpia harpyja Linnaeus 1758) is the biggest American eagle and is one of the biggest birds of prey in the world. It belongs to the vast order of the Accipitriforms (Accipitriformes), to the family of the Accipitrids (Accipitridae), to the subfamily Buteoninae and to the genus Harpia. It is a monotypic species, its closest relative is the crested eagle of Guyana (Morphnus guianensis) which, however, belongs to another genus. The name of the species is a sort of repetition of the genus. It comes from the Latin “harpyiae” and from the Greek “Αρπυιαι”= the raptors”, in the theme of “ἁρπάζω” = “to ravish”. The name Harpy referred to divinities of the Greek mythology, who, in various numbers, were variously conceived by poets and mythographers: imagined originally as winged women, then as monsters with head, bust and arms of woman, and the remainder of the body of bird. In heraldry, it was a chimeric figure with face and chest of a woman, ears of a bear, body, wings, claws and tail of a vulture. The harpy eagle is present in Central and South America with a distribution going from southern Mexico (Veracruz, Oaxaca and perhaps Campeche), crosses Central America from Colombia; eastward through Venezuela and Guyana and south towards Bolivia and Brazil reaching the extreme north-eastern part of Argentina (province of Misiones). This species has greatly rarefied in Central America and in other zones of its range. This raptor loves the lowlands of the tropical forests, normally under the 800 metres of altitude, but with peaks up to 1600 and more as registered in Colombia. It lives in the great natural vegetal extents but it can nest also in reforested areas with high grade practices of silviculture. It prefers hunting in locations where the grasslands and the forest follow each other in a sort of mosaic. At times, early in the morning, it basks perching on roosts and prominences emerging from the vegetation. At times, rarely, is surprised in cultivated and urbanized areas. 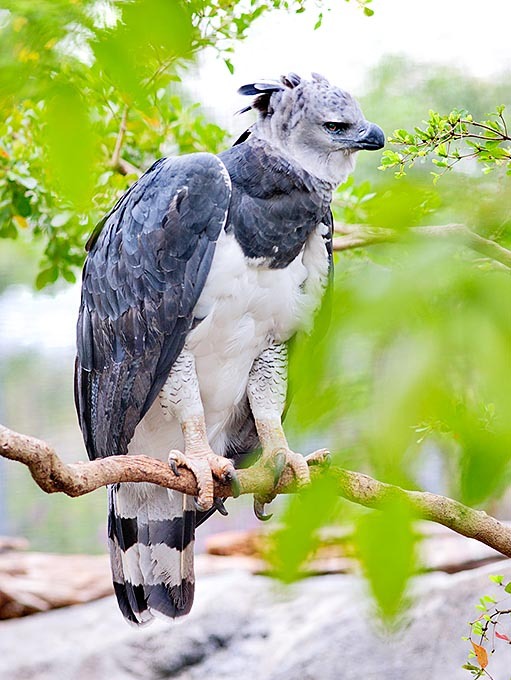 The harpy eagle is one of the greatest raptors with a length of 89-105 cm and a wingspan of 2 metres. Like other raptors, the females are bigger than the males and in the harpy eagle this difference is remarkable with the males weighing 4000-4800 g and the females even 7600-9000 g. It has a stocky body and white-grey livery with various shades of black harmoniously and elegantly designed. The head is grey with some darker feather especially close to a short tuft of feathers present on the apex of the head. The wings are rounded and are not too long if compared to the body in order to be easily utilized in the thick vegetation. Dorsally, they are dark slate grey; darker and homogeneous and strong at the level of the dorsal coverts (small upper secondary coverts and median upper secondary coverts) and more marbled, streaked, speckled and with a slight and little evident strikethrough at the level of the great coverts and remiges always at dorsal level. The lower feathers of the wings, on the contrary, have a colouration more crossed-speckled in dark black-grey and very pale white-grey. Under the grey part of the head, ventrally at level of the neck and of the very first portion of the chest, there is a wide band of very dark grey-black colour in strong contrast with the rest of the ventral plumage of the bird which is white-candid up to the level of the undertail included. The white of the chest may reach the dark band forming a short central tip-line. The dark-blackish ruff melts above with the colour of the back which presents, entirely, a similar dark colouration. The tail is long and streaked in white-black for the whole thickness with the strikethrough, therefore, evident dorsally as well as ventrally; ventrally it is more of streaked pale grey-black colour. The thighs are covered by white plumage finely streaked of black. The legs, very robust and thick, have the naked part of yellow colour and are endowed with the most powerful extant rapacious claws. The iris of the eye can be grey or brownish. The cere is blackish. The beak, quite important, is grey-blackish. The harpy eagle differs from the decidedly smaller crested eagle of Guyana (Morphnus guianensis), which has practically the same geographic distribution, for the big and thick beak; the powerful legs with great claws and the tuft of nuchal feathers forming a typical double point. 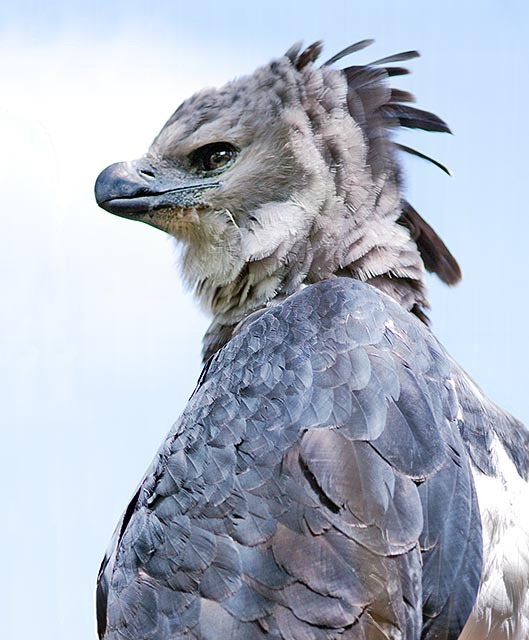 The female of the harpy eagle has a colouration similar to the male, but, as said before, it is bigger. The immature specimens have a plumage which gets an evolution related with the age: the one year old individuals have the whole head, tuft included, white. White are also all the ventral parts of the body; the thighs are not streaked. The tail has 10-12 bars, the dorsal part and the 2 thirds of the wing are pale grey (only the remiges are darker). From the third year the head becomes grey and the back mostly blackish; the thighs and the coverts of the underwing are slightly streaked in a way similar to that of the adult but the dark ruff is still poor and incomplete. Starting from the fourth year the head and the thighs reach the typical adult characteristics, the bars of the tail reduce to 4-5. This is a sedentary species. The harpy eagles are carnivorous and capable to hunt even powerful mammals and rather big such as the monkeys of various species: the howler monkeys (genus Alouatta), the gracile capuchin monkeys (genus Cebus), the white-faced sakis (genus Pithecia and Chiropotes). Its preys are also the two-toed sloths (genus Choloepus) and pale-throated sloths (genus Bradypus), the opossums (family Didelphidae), the Tayras (Eira barbara) and the Paraguaian hairy dwarf porcupines (Sphiggurus spinosus), anteaters, squirrels, coatis and Kinkajous (Potos flavus). It hunts also terrestrial mammals, such as the agoutis, small and medium-sized deer (genus Mazama) as they can seize, very rarely, small pigs, lambs and domestic chickens. It nourishes also of some reptilians including the snakes, the iguanas and the lizards of various species. 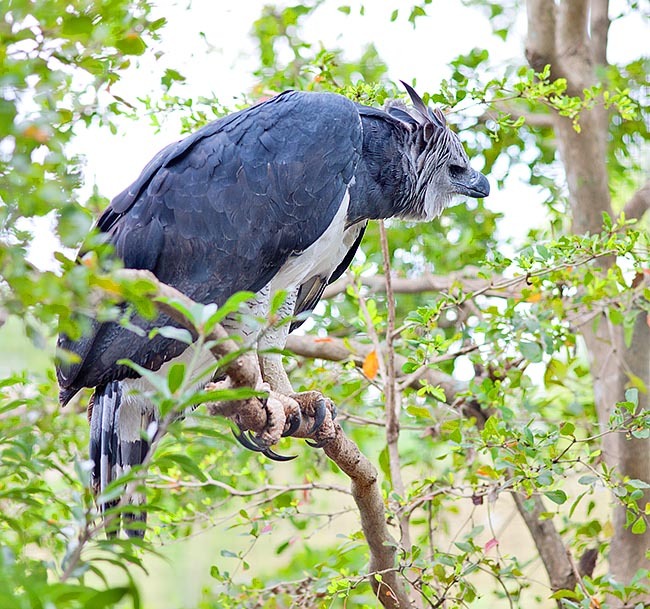 The ample diet of the harpy eagles includes also birds such as the parrots inclusive of the great macaws and including the Hyacinth macaw (Anodorhynchus hyacinthinus), the cracids and the Red-legged seriemas (Cariama cristata). The sloths alone form about 1/3 of the biomass of the hunted preys. This is probably favoured by the fact that, early in the morning, the sloths go up to the tops of the trees for basking and, in doing so, become very visible to the harpy eagles. In Guyana, the capuchin monkeys, especially the adults, are the most important preys. In Argentina, the most predated are the opossums, the tayras and the porcupines. The adults often get back to their nest with only some portions of their preys. The females of harpy eagles, proportionally to their big size, seize bigger preys (2,5-9 kg) than their males (0,5-2,3 kg). Usually, the males of harpy eagle carry to the nest pieces of preys weighing, as an average, 1 kg whilst the females carry pieces which weigh, as an average, 4 kg. The harpy eagles hunt preferably at the limit of the forests and in the clearings besides the vegetal vault itself; often, they wait for the preys close to the riverbeds. The attacks of the harpy eagles are rapid and instantaneous, so much that the preys can be seized and carried directly from the tops of the trees. If the preys are heavy, as perches they utilize horizontal or oblique trunks of fallen trees perching lower down. In spite of the great size, it flies with agility among the treetops in the forests and is endowed, besides excellent eyesight, also of an excellent hearing which helps it in localizing the preys. The data about the reproduction are rather scarce; in Guyana it reproduces in June (rainy season), in the centre of Brazil (Goias), on the contrary, it tends to reproduce in September-November, and chicks have been sighted in November in Argentina. The harpy eagles build great and cumbersome nests resembling platforms which may measure even 150 cm of diameter and 50-75 cm, up to more than 1 m of thickness. Usually, the nest is done on great branches of enormous trees emerging from the canopy (from 15 to more than 40 metres of height) and can be reutilized. In Guyana, often the Kapoks (Ceiba pentandra) tower over the surrounding forest providing ideal sites for the nidification. In Venezuela, they often make the nests on trees of the family of the Lecythidaceae; in Panama, they nidify on trees of the family of the Bombacaceae even if there are records of cases of nidification on palms of the genus Mauritia. The harpy eagles emit penetrating and melancholic vocalizations, repeated at times. The harpy eagles usually spawn 2 whitish eggs, but there is a report of a nidification with three eggs; from what it has been seen they breed only one chick as never has been found a nest containing, at the same time, two young fairly grown up. The second chick serves then as reserve in case the first egg spawned should not hatch. The incubation lasts 56 days and it takes place generally in the midst of the rainy season. Practically the whole incubation is performed by the female (97%); the male during this time has the duty to carry one or two preys per week close to the nest for nourishing its partner. The chick is born with a dirty white down. The fledging is variable and happens between the 140 days and the 6 months of age and in any case the young remains close to the nest, in a range of about hundred metres, for about 12 months. The adult pairs may therefore reproduce, successfully, once ever three years or little less. For living, this species needs ample forests and rich of biodiversities being therefore sensible to the deforestation and to the fragmentation of the forests caused by the man. In their own area the harpy eagles appear having different density of population and distribution depending on the geographic areas resulting however, being apex predators, always rather scarce and scattered in their own territories. The one who will have the chance to see from the true this wonderful bird, for instance in one of the zoological parks having the privilege of hosting it, will really have the sensation of being in presence of a mythological animal having a look transmitting a deep and understandable ecological message as it were on of the magnificent animals stars of the film “Avatar”.